Wit, humor and suspense are what you will find in this unconventional Austen continuation from Amanda Grange. Mr. Darcy, Vampyre is a tale of what happens with Jane Austen’s Pride and Prejudice characters, but with a supernatural twist. Elizabeth and Darcy abandon their scheduled honeymoon plans and head for the continent, much to Elizabeth’s bewilderment and excitement. But soon she finds there are problems, not only with their trip, but perhaps with their marriage. Through France, the darkest forests, the mountains of the Alps, Venice and southern Italy they travel, all the while being followed by a malevolent specter that, in Elizabeth’s mind, could be real or imagined. What happened to her image of the perfect married life with Darcy? Some of my favorite parts are where Darcy and Elizabeth tease each other with lines from Pride and Prejudice. They go to a ball and Lizzy reminds him that, “any savage can dance”. He remarks on her fine eyes. There does come a point where danger is near, and then it passes and you wonder why Elizabeth isn’t questioning the strange happenings more than she does. She seems to think people are hostile because Darcy married beneath himself, while we, the reader, know from the start that Darcy is a vampire. Another curiosity is the type of vampires the author has created. I haven’t read a lot of vampire novels, but I have seen TV shows and movies and I know that people put different beliefs to them. The drinking of blood and eating food bit is not really expanded on in this novel. More details would have been nice, but with the ending are not really necessary. I enjoyed the historical details of the fall of Venice to Napoleon and, of course, the descriptions of post-Revolution France. 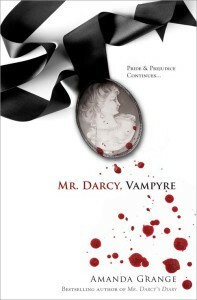 One last thing to ponder: Mr. Darcy isn’t the only P&P character who is undead. Enjoy!